Simone Biles battled through the pain barrier to help the United States win the world team title at the World Gymnastics Championships in Doha and earn her 11th career gold medal in the competition. The 21-year-old, who has been suffering from a kidney stone since being rushed to hospital in the Qatari capital, was not her usual dominant self but it barely mattered such is the evident gulf in class. 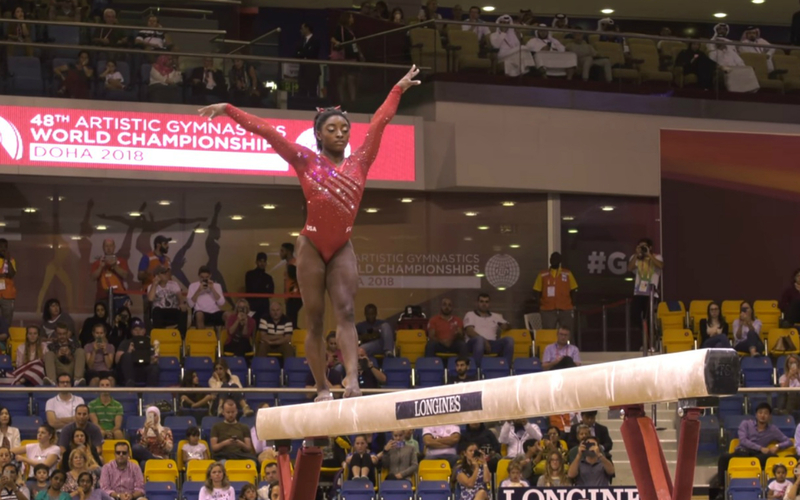 Biles almost fell from beam, on which she was out-pointed by her team-mate Kara Eaker, and stepped out on floor, while she resisted the temptation to take a risk with her new ‘Biles’ vault which had top-scored in qualifying. Biles said: “I still feel pretty good – I’m in a little bit of pain but it’s nothing I can’t manage and I haven’t had to do anything differently apart from missing one training session. Biles could make history when she returns to action in the women’s all-around competition, where victory would make her the first woman to win five world all-around titles. Hurd, who claimed gold at World Championships in Montreal last year during Biles’ 18-month absence from the sport, appears to have already conceded that her reign is coming to an end. “I’m competing against the greatest of all-time, so I’m not really thinking about that,” said Hurd, who will nevertheless expect to join her good friend and team-mate on the podium. Defending champion Xiao Ruoteng of China is expected to retain his men’s all-around title in the final, in which Brinn Bevan and James Hall compete for Great Britain.